There’s exciting news in East County! 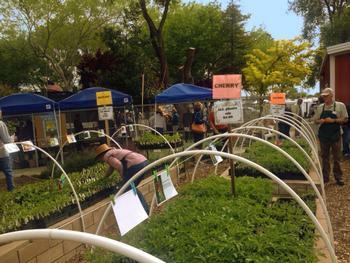 The UC Master Gardener Program of Contra Costa has established a new demonstration garden, Mangini Garden, at the Contra Costa County Fairgrounds in Antioch. Mangini Garden is open to the general public every Tuesday from 10 am to noon, February through October. Stop by, visit and wander, and get your general home gardening questions answered. Mangini Garden boasts an indoor classroom for presentations and a large park to have classes under the trees in good weather. Join UC Master Gardener speakers starting in March 2018 for short demonstrations & classes covering topics such as fruit trees, vegetables, bugs, tools and irrigation, all offered free to the community. And, our crack Ask A Master Gardener team will be available each class date. A list of classes, dates and times can be found here. 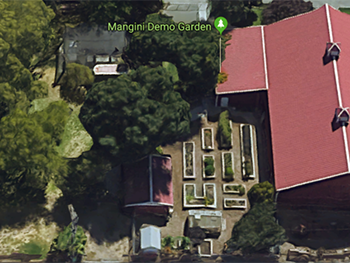 Mangini Garden is located within the Contra Costa County Fairgrounds at 1201 West 10th Street, Antioch, California. Enter the Fairgrounds from West 10th Street, between O and L Streets. As you head into the Fairgrounds, take the first right into the Fairgrounds Administration parking lot. Starting in 2002, school nutrition tours were held at the former Mangini Agricultural Museum within the Contra Costa County Fairgrounds for garden-enhanced nutrition education. This program was co-sponsored by the Fairgrounds, the UC Nutrition in Schools Program, the Contra Costa Farm Bureau and the UC Master Gardener Program of Contra Costa County. The program folded many years ago, and the garden was abandoned and went fallow. In 2016 and 2017, the UC Master Gardeners held successful Great Tomato Plant Sales at the Fairgrounds, and that success gave motivation to work with the Fairgrounds to re-establish the site as a new demonstration garden. Mangini Garden is now a focal point in East County for home horticultural outreach and education activities. The garden is the East County version and little sister to the demonstration garden known as Our Garden in Walnut Creek. Mangini has nine raised garden beds with drip irrigation and a new greenhouse that has doubled the propagation yields. A vigorous and self-sustaining composting program has been established to demonstrate what composting can do to change a garden’s health and productivity. A small sensory and native plant bed has been established to represent an example of low-water and colorful landscape. All fruits and vegetables organically grown in Mangini Garden will be donated to local charitable organizations to help those in need in East Contra Costa County and to educate and promote healthy nutrition.